At the age of nineteen I started teaching exercise classes at the YWCA. Being a young mother, I realized that the affects of regular exercise went beyond the physical benefits visible to the eye. For many years I have educated, counseled, motivated and encouraged others to make exercise a priority in their lives. I would tell them that exercising regularly was critical for my emotional and mental health. I was a better mother because I had taken time out for myself in a way that benefited my physical body, but more importantly my attitude and self-esteem were strengthened in the process. What could possibly be more important than that? The more life-experience stress I had, the more I understood how stress plays a significant role in why some people do everything ‘right’ and still have difficulty losing fat weight. There are many more factors that contribute to health and fitness than most people in the Western part of the world want to believe! Westerners tend to believe the body is separate from our mind and spirit and tend to deal with looking at and dealing on a physical level with the body. Eastern cultures understand the intimate connection to the body, mind and spirit. Many Easterners practice Yoga, Tai-Chi or Chi-Kung daily to stimulate, rejuvenate and heal their internal organ functions, eliminate blocked energy, and increase their life force energy or “chi”. They also believe that a flexible body promotes flexibility in the mind; and illness and disease can be eliminated by creating and maintaining strong chi. These Eastern practices have been around for thousands of years because they work! I discovered that what our Western culture is missing is recognizing this body-mind-spirit connection and honoring it through movement. For we are not our physical body occasionally seeking spiritual nourishment in times of need…we are spirit having a physical experience! Keeping this in mind, I wanted to create a workout that would mingle Eastern with Western. This is how Motiyogachi came to be. 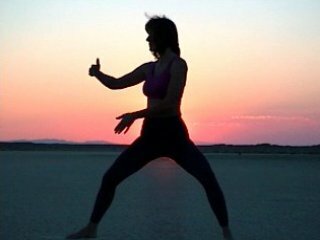 A lot of thought went into creating a class that would work the body’s physical system, energize the spirit and calm the mind.